Cats are on my mind. Last fall I took in a beautiful white stray, Shiro, who has settled in quite nicely and now a little kitten has also joined our home. I am calling her Kitty Kat for now until a better name comes to me. It is always amusing how our cats like to be in the thick of things when you are quilting. Exploring other people’s blog, there often seems to be a cat keeping company with the quilter. Is it any wonder that I was drawn to the cat blocks I found at the antique market in Kawagoe, Japan. They show the delightful characteristics of cats while also representing different cultural aspects of Japan. Of course, I have included some Sashiko. I tried the natural cotton thread first thinking it would bring out the colour of the printed pictures on the red but, against the dark background, it looked more white than natural and seemed to shout and overpower the cat blocks. My friend, Clare, suggested that the Sashiko in red might be more effective. It was worth unpicking the natural to replace it with the red. It always great to have having another set of quilter’s eyes. Well, here in Toronto we are still in a deep freeze with no end in sight and I have been feeling the freeze in both my quilting and blog entries. What helped me to get moving again was a workshop offered by Helen Garland and her mother Barbara Garland. I have attended a lot of workshops but I can honestly say that I have never attended one so well prepared, well-paced and warmly supported. Helen Garland is the Vice-President of Yorkshire Rose Quilters Guild of Toronto and a fan of Ruth McDowell’s Technique and Method. Her goal was to demystify Ruth’s method by condensing her techniques into a six hour workshop. The emphasis was on the designing end of the process which included: transferring our chosen images into a workable drawing; finding section lines; working within major section lines to define or capture the essence of the image; and detailing what to do once the design is complete so that it becomes an art quilt. Here are some of the quilts produced by Helen and her mother using this process. Helen provided the workshop participants several handouts for using later in practicing different types of seam joining. I was challenged by this technique but followed through the design process with my chosen picture taken of a lotus bud in the large pond in Ueno Park, Tokyo. I am not sure when I will complete this quilt because the process has broken through my quilting lull and I am now working with some of the wonderful fabrics I brought back from trip to Japan. Stay tuned for “Cats Will Be Cats”. Sharing My Love of Quilting, Again! While in Japan, I was able to visit New International School where I had worked for four years. It was wonderful to spend time with my former boss, Steven Parr, to see other people with whom I had worked and to see so many great improvements. I was very impressed with the art teacher, Adam Hosmer, and as we talked, I was invited to share my love of quilting with the students. The school was beginning a new term with a change in timetabling so that the boys and girls in Upper and Secondary School were separated for art and gym so I had a nice long class with the girls. Only one of the students knew about quilting from her American grandmother who from the sounds of it is an avid quilter herself. I presented a Power Point on a brief “History of Quilting” and then moved into quilting today using some of the wonderful quilts from the Yokohama International Quilt Show to show the great variance in techniques and styles. With only one class, there was no time to actually get into sewing but Mr. Hosmer and I decided they could design a block cutting and pasting paper from the recycling bin. We also added some new origami paper into the mix. Using the idea of a crazy quilt, the girls designed their blocks around their own central motif. It was agreed that Mr. Hosmer would facilitate the completion of the blocks and the girls would decide how to arrange them into their wall quilt. Thanks so much for your presentation and workshop last week. The students really enjoyed learning about quilts, and found the work to be exciting and challenging. 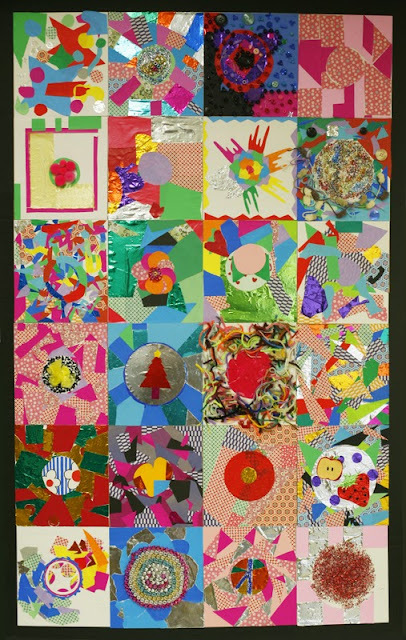 One student has expressed an interest in making a quilt as her piece for the annual Artscape Exhibition. Here is an attached image of the final piece. We hope you like it! A special thanks to Steven Parr, Adam Hosmer and the girls of Upper School and Secondary, New International School in Tokyo for giving me this opportunity to share my love of quilting. Note: Artscape is an annual event organized to showcase the art work of students from different international schools in Tokyo. it is always amazing to see the creative and skill displayed by the students. Well, this is my last posting from Japan and I would be remise not to say anything about where to shop for fabric in Tokyo for those of you who are thinking of a trip here. During the five years I lived in Tokyo, I can’t believe I never went to the Fabric Town (Nippori Sen-i-gai) located in the north-east part of the city. During that time, I mainly quilted with the fabrics I found at antique markets and a store, Kinkado, which was near the school where I worked. Sadly, that chain of stores is now closed. Nippori Sen-i-gai is easily accessible by the JR Yamanote line. If your stay is short in Tokyo and you only have a day for fabric shopping, this is the place to go. If you go to this website, you will find an English map. The following are three of my favourite places I found in Nippori Sen-i-gai. Mihama Cloth is #45 and 46 on the map. This shop sells precut cloth at discount prices (2 m for about $12.50 Canadian). You can’t open the packages and the sale is final but the selection is amazing if you are into traditional Japanese prints. They also carry some fabrics that are no longer in print so you have a chance to find something unusual. The last shop I really enjoyed was Tomato, #49 on the map. It carries a large selection of everything – indigo blues, traditional prints and modern, current Japanese fabric designers - Echino and Kayo Horaguchi Fabric. Tomato also carries a large selection of Japanese themed panels. In Nippori Sen-i-gai, you can also find shops selling used Kimonos, hoari (kimono jackets), obis and vintage fabrics pieces. I found the prices comparable to what you would pay at the antique markets. What looks like a shorten Kimono is a hoari. This is a jacket worn over the kimono to protect it. These hoari on the right show the shibori technique of dyeing. If you still have time to shop, head back down on the JR Yamanote Line to Shinkuku Station, the largest station in the world. It is well-signed in both Japanese and English so follow the signs for the East Exit. Stay to the left as you walk out of the exit and you will come to a crossing. Go down one block on the street you are facing and turn left at the pink store, “attagirl”. On your right you will see Okadaya, a fabric store. On the first floor, there is an area with a large selection of Japanese fabrics including many indigo blue prints. My four weeks here have flown by and I have very much enjoyed spending time with my sister, Micheline, and my friends. I have revisited many of my favourite places and explored some new places. It is sad to leave but I also look forward to being home again. During the five years I lived in Tokyo, I can’t believe I never went to the Fabric Town (Nippori Sen-i-gai) located in the north-east part of the city. During that time, I mainly quilted with the fabrics I found at antique markets and a store, Kinkado, which was near the school. It is now closed. Tsukiyosu Hiroshi Shouten is #35 on the map. This store has on display a large selection of Japanese theme panels for about $10.00. It also has a large selection of smaller cuts of traditional Japanese prints, some 50 x 53 cm, for only about $2.50. Mihama Cloth is #45 and 46 on the map. This shop sells precut cloth at discount prices (2 m for about $12.50 Canadian). You can’t open the packages and the sale is final but the selection is amazing if you are into traditional Japanese prints. The last shop I really enjoyed was Tomato, #49 on the map. It carries a large selection of everything – indigo blues, traditional prints and modern, current Japanese fabric designers. Tomato also carries a large selection of Japanese themed panels. Here you can also find shops selling used Kimonos, hoari (kimono jackets), obis and vintage fabrics pieces. I found the prices comparable to what you would pay at the antique markets.